An interesting day for trading the euro vs dollar yesterday, which moved consolidating sideways all day as the forex market waited for the FOMC statement, before rising sharply on the initial news, only to fall back almost immediately and continue lower, ending the trading session with a wide spread down bar which closed marginally above the 9 day moving average. The FED rate decision and statement provided few surprises to the currency markets, with rates being kept ultra low for the foreseeable future, thus offering little encouragement for US dollar bulls, with the only respite for the dollar coming from the FED’s view that the jobs market was still seen to be struggling to recover. This in turn spooked the equity markets with the dollar benefiting as a result and prompting a late fall in the euro vs dollar as a result. Whether this sentiment will continue in the markets today seems unlikely, since the jobs data is in the public domain both weekly and monthly, so hardly a new piece of fundamental news!! 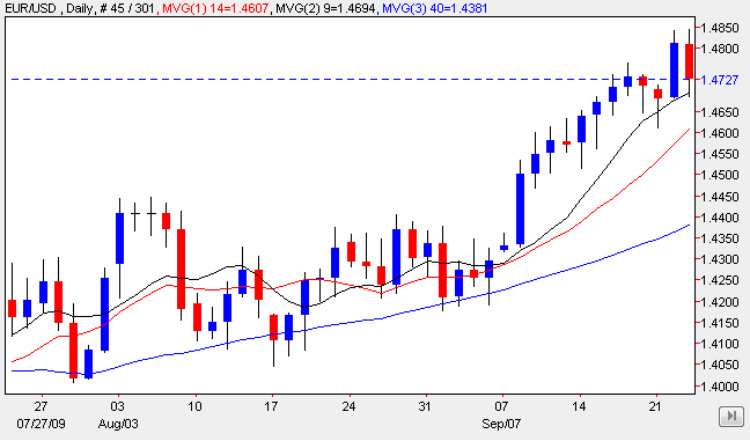 From a technical perspective the 9 day moving average is still providing excellent support to the move higher, despite yesterday’s minor pullback, and therefore with the bullish sentiment remaining firmly in place after last night’s statement, we should see the euro vs dollar move higher in the short term, and continue to attack our initial target of 1.50 with a longer term view of 1.55. With the sell off yesterday now complete, this morning provides a good opportunity to open small long positions once again in the euro vs dollar pair. All the items of fundamental news on the economic calendar for today are covered for you in more detail on the euro to dollar site, but do remember we now have the two day G20 in progress so any comments from the great and the good will be analysed in great detail with the markets reacting accordingly!